I know it’s not Thanksgiving anymore but, to be honest, I could eat Thanksgiving dinner all year round! I certainly don’t need the turkey, stuffing and cranberry sauce leftovers in my fridge for my taste buds to crave those delectable goodies. All it really takes is a rerun of Diners, Drive Ins and Dives on the Food Network. I watch a lot of unique, i.e. crazy, food being cooked on this show, but one sandwich caught my eye and I just had to try making it in my own kitchen…a classic Thanksgiving Sandwich! I already had most of the ingredients in my house and it just seemed so simple and strange. Right up my alley! First things first, place 2 slices of white bread on a plate. Not too difficult, right? Smother one slice with mayo (I used a bright yellow spicy mayo because it was in my fridge and tastes delicious on anything) and the other side with cranberry sauce. Again, not much too it. 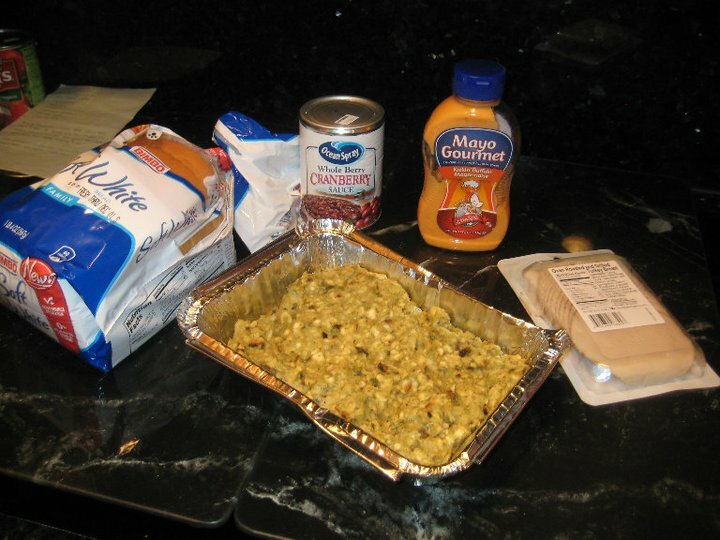 Then place a nice heap of stuffing on top of the mayo. 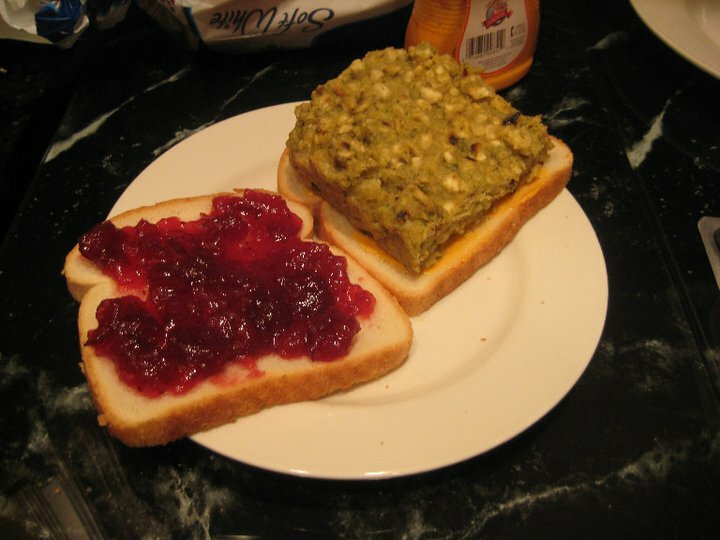 I used a boxed stuffing, which was pretty tasty, so I was able to slice a square piece to fit the bread shape. I’m sure that some leftover stuffing directly from the Thanksgiving table would have been tastier, but alas, the holiday dinner for 30 that I hosted in my new home was months ago! The last step is the turkey! 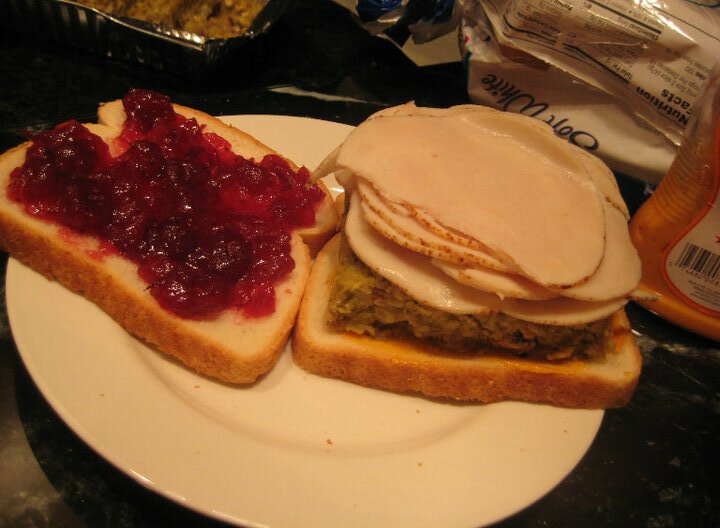 I always have turkey in my fridge because I am “trying” to be healthy so I just pulled out a package of sliced turkey and piled it on top of the stuffing. So good! 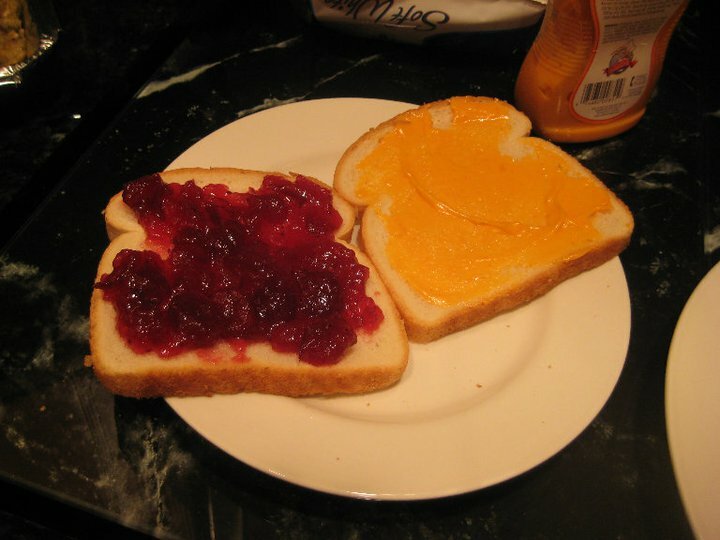 Doesn’t it make this sandwich actually look…um…wholesome? So how did it taste? Amazing and heavy! The white bread couldn’t really withstand the weight of the stuffing and turkey so it just fell apart. Didn’t stop me from putting the sandwich back together to my liking. Just a sandwich? I don’t think so! Try it for yourself. 5 Comments on "The Diner Thanksgiving Sandwich"